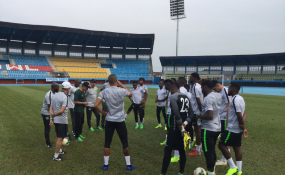 Nigeria coach Gernot Rohr has advised the South African national team not to play for a draw in their crucial Africa Cup of Nations qualifier against Libya on Sunday. Heading into the last round of matches in Group E of the qualifiers, Bafana Bafana sit second on the table with nine points and a draw against the North Africans would be enough to see them through to the AFCON. "If they say they will go there and play for a point, that's very risky. And I don't think Baxter will do so," Rohr told Soccer Laduma. "He will want to try and win the game like we did. He will attack. I don't think Libya will go all out either just because they need to win. "They will definitely play aggressive, but not risk everything. They, too, have clever players. It will be an interesting game tactically. "Maybe Baxter will set his team up for counters, like they did against Nigeria in Nigeria when they beat us 2-0. "Because every time South Africa need to dominate a game, they are struggling, as we have seen against Seychelles, for example." Nigeria beat Libya home and away in the 2019 AFCON qualifiers, with former Watford striker Odion Ighalo accounting for five of the seven goals scored by the Super Eagles.